A UK-wide helpline for victims of stalking has been launched. The phone service, which is funded by the Home Office and private donations, was developed with the police. Campaigners say stalking is under-reported because victims fear they will not be taken seriously. They estimate there are up to two million UK victims. 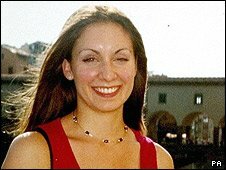 Tricia Bernal, whose daughter Clare, 22, was shot dead in a London Harvey Nichols store by her ex-boyfriend in 2005, helped to set up the helpline. At the time of the shooting in Knightsbridge, Michael Pech was awaiting sentencing after admitting harassment. The former soldier stalked Ms Bernal after the end of their brief relationship earlier that year. Would you know if you were being stalked? After killing Ms Bernal, from Groombridge on the Kent/Sussex border, he turned the gun on himself and committed suicide. The confidential helpline has one number for callers anywhere in the UK and there will be a single point of contact in every police force. The service will be run by Protection Against Stalking, formerly the CRT Trust, the charity Mrs Bernal helped to start in 2008, in collaboration with the Suzy Lamplugh Trust and Network for Surviving Stalking. Alexis Bowater, chief executive of the Network for Surviving Stalking, said it was important people who thought they were being stalked had someone to turn to. "Of course the first point of contact if you are being stalked or think you're being stalked should be the police. But some people feel that they can't talk to the police about it and this is where the helpline will come in," she said. Tracey Morgan, who founded the network after her own personal experiences, said many victims are still not taken seriously enough despite new laws introduced in 1997. "This is not just a nuisance crime, this is about murder prevention. "If victims are questioning 'am I being stalked?' because they are isolated, because they're questioning their own sanity, it will be somewhere for them to call to say 'I'm not sure, what do you think?'. "They'll be given lots of advice on keeping a diary and where to go for help, and the police will then take it seriously," she said. A survey by the University of Leicester, which was the biggest of its kind in Europe, found that three-quarters of victims wait until there have been at least 100 incidents before they approach the police. Can dangerous stalkers be tackled?